The computer market is literally flooded with computer cases, from the conventional desktop style case to the stylish SFF enclosures for home entertainment systems and of course my "personal favorite", tacky cases. You know what I'm talking about - those cases that look like faces, robots, and have oodles of plastic doodads that try to look "super special" but end up looking like bad sci-fi television props. Thank god there are also sane manufacturers who design cases more for usability than just to grab unnecessary attention. Cooler Master truly is one of the case "masters" and its designs are always well received. It's also clear that Cooler Master has the respect of its peers when hardware manufacturers use its products to demo the latest and greatest technologies. From its original WaveMaster (which was blatantly ripped off by other companies) to its COSMOS and Stacker series, Cooler Master's cases just look good. What sets Cooler Master apart from the rest of the market are well thought out internal designs. The Cooler Master Stacker series of cases has been with us for quite some time, now it's evolving once again. Today PCSTATS is checking out the massive CM Stacker 830 SE - an elegantly designed full size ATX case that just looks awesome. Most high end cases do not come with a power supply but Cooler Master has bundled a 1000W RS-A00-EMBA PSU with the Stacker 830 SE. That's large enough for whatever you want to stick into your computer, even multiple videocards. 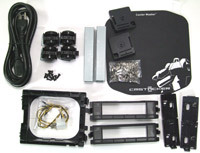 User's Manual, Assorted Mounting Accessories, Screws, Wheels, Mouse pad, bay covers, etc. The Cooler Master Stacker 830 SE is compatible with E-ATX, ATX and m-ATX motherboards and is made almost entirely of aluminum which is at least 1mm thick. This is a big case... a man's case... a case the size of a 777 Dreamliner. The Stacker 830 SE gets its "Stacker" name due to the nine open 5.25" drive bays available. That's a lot of space for devices! Internally there are four hidden 3.5" bays and the case supports four front panel USB 2.0 ports, an IEEE 1394a port and has a microphone and headset jack. Two USB headers, audio and Firewire. Fans are placed strategically though out the body of this aluminum beast, and there are plenty of other details for the enthusiast to appreciate. The case alone retails for just $202 CDN ($200 USD, £98 GBP) without the 1000W power supply, but we were unable to find a retailer that sells both the power supply and case together. The Cooler Master Real Power Pro 1000 RS-A00-EMBA power supply retails for $304 CDN ($300 USD, £148 GBP) on its own. Incidently, this also happens to be the case Nvidia used to launch a certain recent dual-GPU videocard and quad-SLI graphics platform. 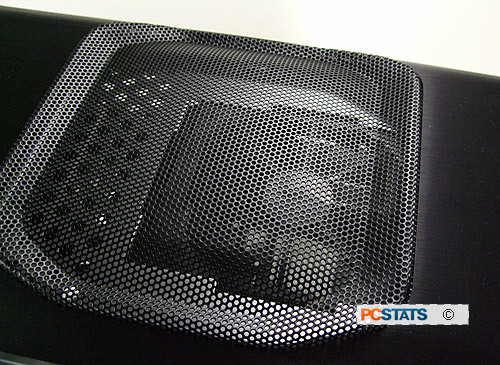 Top Exhaust fan expels hot air from the Cooler Master Stacker 830 SE. 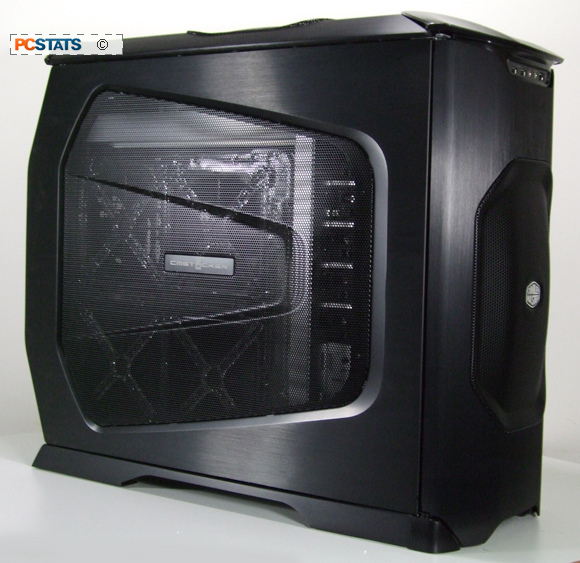 The Cooler Master Stacker 830 SE is quite an awe inspiring case to look at. It has quite a modern feel, yet it's not full of pointless gimmicks like the other brands. The aluminum tower stands 53 x 24 x 65 cm in size, so you'd better have a lot of space on your desk... or below it. The Stacker 830 series cases come in a few different colour configurations and the 830 SE is the all black model. The 831 SE is a blend of a silver case with black grills and the 832 SE has a different face but has the same internal design. Two 3.5"- to - 5.25" bay adaptors are supplied. As mentioned earlier, E-ATX, ATX and m-ATX motherboards are compatible with the Cooler Master Stacker 830 SE. 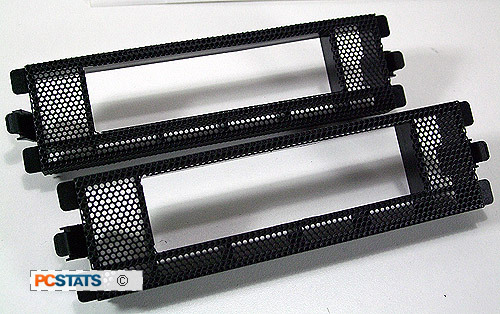 There are seven PCI expansion slots available on the motherboard tray and the holes on the tray allows for fresh air to reach the back of the motherboard, useful since manufacturers are starting to put heatsinks on the back of boards these days.